When Adam was born, he got a few moments to cuddle with his mom, but then the nurses wanted to get him to the NICU. I moved to hand him to a nurse, but she said, “You can carry him, just follow me.” I’d been a parent for all of 10 minutes, but there I was carrying my 4 lb. 12 oz. newborn son down to the NICU. I stayed with him while they started an IV (it took five agonizing-to-watch attempts) and got him on oxygen. I stayed with him for an hour (an hour for which my wife still hasn’t entirely forgiven me) before I finally tore myself away. My wife and I spent the better part of the next 17 days in the NICU with him. Even though he was mostly just lying there sleepily, awake for only 30 minutes at a time between naps, it was still hard to leave him. We drove the 13 miles to and from the hospital two or three times every day until he got to come home (on Father's Day). Adam's first moments at home. This morning, two years to the day since he came home from the hospital, I took Adam to daycare. The whole way there, he was singing the names of all the people (and dogs) he’d see at daycare. He ran to the door. But as soon as we walked in, he started grabbing at me and whining, “Up, please? Dada, up...” He was begging me not to leave him. I don’t worry about him for half a second while he’s at daycare. He’s happy, engaged, actively learning, and safe. But still, it broke my heart to pull him off me and walk out the door. I can’t imagine the experiences of families escaping terror in their homes, coming to the United States seeking asylum, and having their children ripped from their arms. These parents aren’t leaving their infant or toddler with loving NICU nurses or saintly daycare providers, but with uniformed officers who are not allowed to provide comfort to the child, and kept in cages. The parents and children have no idea when or if they'll be reunited. I say, “I can’t imagine,” because that’s what we all say. “I just can’t imagine,” we say, shaking our heads. Of course, it would be more correct to say, “I don’t want to imagine.” I’ve tried to imagine what that would feel like for me if Adam were taken away, not knowing where he is or when I’d see him again. It's not that I can’t imagine, it’s that I’m not willing to. I refuse to imagine it. It's too terrifying, too damaging to even allow the thought any entry. Some say the policy is a "deterrent," even though many of these families are legally seeking asylum and that the U.S. is likely violating international law. Laws aside, it's unethical for any country, any human, to treat children like this. I don't want to think about the situation of these families, but I owe it to them to try. Because maybe by really, fully considering the horror they are living I can be forced into action. The most striking discovery I’ve made since becoming a dad is the shifting economics of time and productivity... A sneaky little irony about parenthood is that you suddenly have less time but you get more done than ever before. Since becoming a dad, I’ve become a lot more productive. And the irony here is that I have far less time to myself. For me, that means that when I'm finally done for the night, I tend not to stare mindlessly at my phone, reading whatever new horrors Twitter presents. Instead, I more consciously choose to read or watch a movie. John Wick and John Wick 2: I watched the first movie when I was home with a fever. What a fun, classic action movie–and the sequel is just as good. Logan, Guardians of the Galaxy, Vol. 2, Wonder Woman, Spider-Man: Homecoming, and Thor: Ragnarok: The annual slate of comic book movies had some pleasant surprises (Logan, Thor, and Wonder Woman), as well as some reliable, if unremarkable, hits (Guardians and Spider-Man). While I think Wonder Woman was overrated by most, anything new is good. Children of Men: I'd seen this movie before, but not in ten years. Watching it again in 2017, with everything going on in the world and being a new parent, it felt like a brand new experience (though the cinematography was just as gorgeous as I remembered). Dunkirk: Christopher Nolan's movies had become a bit overstuffed lately, at least in terms of plot. The simplicity of this story really let the craftsmanship of the film shine through. The Vietnam War: This Ken Burns documentary is just as good as everybody has said. Star Wars: The Last Jedi: I could write a whole post about this, but the world doesn't need that right now. I'll just say that this is a Star Wars movie that really tries to be about something–and I think it succeeds marvelously. Get Out: Another movie that tells a taut story well. Deserving of its inclusion on all the end-of-year lists. Lady Bird: Set in an all-girls Catholic high school in 2003 (I graduated from a Catholic high school in 2001 and now work at an all-girls school), this movie got just about everything right. Irredeemable, Mark Waid: I devoured this series from Mark Waid. A fun subversion of the usual tropes: what if Superman turned evil? Saga, Book 2, Brian K. Vaughan & Fiona Staples: Still the best comic series out there, and one of few that I still look forward to monthly. The Pillars of the Earth, Ken Follett: I'd been scared away by the sheer size of the book, but I was looking for something long I could really sink my teeth into, and this didn't disappoint. For such an expansive work, it actually focuses on relatively few characters, so by the end I felt very invested in them. The Song of Achilles, Madeline Miller: I loved everything about this novel, and can't wait to read Circe. Rare is the writer in this genre of historical fiction who has a grasp of the history/mythology and is also a strong writer. Reinventing Organizations: A Guide to Creating Organizations Inspired by the Next Stage of Human Consciousness, Frederic Laloux: This book deserves its own post. I find myself thinking about the ideas in this book far more than any other I've read recently, and I even purchased a copy for my school's President and Principal. The Rise and Fall of the Third Reich, William L. Shirer: Another book whose length scared me away for a long time. Despite being a bit dated, its combination of history, research, and a journalist's first-hand account was eminently readable and powerful. What This Cruel War Was Over, Chandra Manning: The Civil War was about slavery. This shouldn't be a fact that was still debated in 2017, but it was. Manning's research makes it pretty clear: the Civil War was fought over slavery. Evicted: Poverty and Profit in the American City, Matthew Desmond: A powerful account of the ways that people can be trapped in a cycle of poverty by the housing system–this made me angry. An American Sickness: How Healthcare Became Big Business and How You Can Take It Back, Elisabeth Rosenthal: A powerful account of the ways that the American healthcare system also traps people in a cycle of poverty, usually for one simple reason–greed. This book also made me angry. Watching the nurses try four different times to get that IV in was quite the introduction to fatherhood. My son was born 6 weeks early, and spent 17 days in the Neonatal Intensive Care Unit. After that, he spent another 90 days on supplemental oxygen at home. After all that, and multiple visits to see specialists, he is a healthy, happy baby. I am still new to parenting, but one thing I'm learning quickly is that I will never stop worrying about him until the day I die. He's only 7 months old, so I'm very aware that I have only scratched the surface of these anxieties. For a long time, we only ever knew him with a nasal cannula and oxygen tubes. Before my son had left the hospital, he had racked up almost a quarter of a million dollars in medical bills. (Fortunately my wife and I are insured through our employers, though we have spent entire days on the phone as his primary insurer tries to avoid paying his bills–that's another story.) From the moment he was born, my son had what could be considered a "pre-existing condition." Prior to March 23, 2010, that would have meant that if my wife or I (or he, later in life) ever had to purchase a healthcare plan, he could be denied coverage. Studies show that not having health insurance can lead to depression, bankruptcy, and death. I'd rather my son not have to deal with any of those. He may've only worn it once, but it was worth every penny. Fortunately for him, he was born in 2016, after the passage of the Patient Protection and Affordable Care Act. This law, among other things, made it illegal for insurance carriers to deny coverage for pre-existing conditions. That meant my son wouldn't be punished throughout his life simply for arriving 6 weeks early. The phrase "pre-existing condition" would not hang around him like some terrible birthmark. On the endless list of things to be worried about for my newborn son, his ability to get insurance was able to slide down somewhere above "scorpion crawls into his boot at summer camp," but below, "heart broken when his first love turns out to be a Jason Bourne-style secret agent and leaves him." At one point does his fascination with his toes go from adorable to concerning? But as of today, January 12, 2017, all of that is changing. Those protections for people like my son, for people with cancer, asthma, high blood pressure, or myriad other conditions are in the process of being destroyed. Now the possibility of my son being denied healthcare because he or his parents cannot afford it is very real. I need to get myself more adult onesies. This isn't political, it's personal. There are so many things I cannot control, unknowns from which I cannot protect my son. Right now, my wife and I have insurance from our employers, and we are able to provide for our son. But the future is unseen, and it is frightening enough without having to add concern for basic healthcare for my son. I just feel like he doesn't deserve to get sick and die just because he was born early. But maybe I'm biased? I was born in 1983, so for my childhood there existed only three Star Wars movies. From as early as I can remember, there were no movies I loved more. But I didn't actually own them; there were no cheap copies to go buy, so I had to rely on the local video stores to rent them whenever I wanted. At least a couple times a month, I'd head to the video rental section at Schnuck's or Doy TV Repair. God forbid they were rented out when I wanted them–I'd have to wait days to watch them. I wore out these copies from the video stores. They had to be repaired a couple times, if I recall. So like most kids my age there was nothing except those three movies to foster my obsession with all things Star Wars. That changed in 1997 when filming started on Star Wars Episode I: The Phantom Menace. Entirely new Star Wars movies? That was unfathomable. The still-new-to-me Internet connection at home meant I spent hours (and it did take hours over dialup) downloading that first trailer. Of course, The Phantom Menace and the rest of the prequel trilogy was mostly disappointing. The anticipation for each movie was in many ways better than the movies themselves. When the first trailers came out for Episode II and then Episode III, I was excited each time. Because no matter what happened, these were Star Wars movies. This wasn't James Bond, with dozens of movies, some good, some not. Once this prequel trilogy was over, who knew if there'd ever be any more? It had been 16 years between Return of the Jedi and Phantom Menace, and there was every indication that Revenge of the Sith would be the last Star Wars movie for a long time. Of course, in October 2012, The Walt Disney Company purchased Lucasfilm, and announced there would be a brand new trilogy. Like so many others of my generation, that anticipation I felt as a kid returned the moment I saw the first trailer for The Force Awakens. And yet, there's something very different this time (in addition to me being a grown adult). That scarcity that made the original trilogy, and to a lesser extent the prequels, so special is nonexistent. Already they've announced that there will be "Anthology" movies in the midst of the new trilogy, with two announced so far, meaning there will be at least one new Star Wars movie released every year for the next few years. Of course I'm going to see all of them, and many of them will be good and some will be really excellent. But knowing that Star Wars is now just another Disney franchise makes it harder to get excited about any individual movie. The Marvel Cinematic Universe is facing the same dilemma. When there's such saturation, it's difficult for any single movie to stand out. If you didn't like Age of Ultron, that's OK, because Ant-Man will be out soon, and then Captain America: Civil War with most of those same characters. There have been some great Marvel movies, and some surprises, but there's a predictability and a sameness to them that will almost certainly seep into these new Star Wars movies as well. I remember being genuinely excited about moving away from home so I could eat an entire package of Oreos without my parents telling me no. Of course, I quickly learned in college that sometimes it's best to not eat all the Oreos (I learned that lesson with many different foods and beverages, really). Point is, I'm glad there will be more movies set in the Star Wars universe that I've loved since I was a kid, but I will miss having the opportunity to really miss them. Teachers should love their jobs! They should look forward to Mondays, not Fridays. I do love my job. I also enjoy weekends. Nobody really liked that guy. Now that I have a house of my own, my parents are trying to get rid of all my stuff they've saved over the years. School papers, photos, toys, books—even after multiple moves, they've kept even more than I'd thought. There are quite the time capsules saved in their basement. There are several photo albums, mostly blurry shots of unknown subjects taken by me, but some pictures of me and the family through the years. Here I am with my great-grandfather in Greers Ferry, Arkansas. I always liked the first day of school. I'd guess this was second grade. They also saved a bunch of my toys, thinking that some day my children will want to play with 25-year-old action figures. 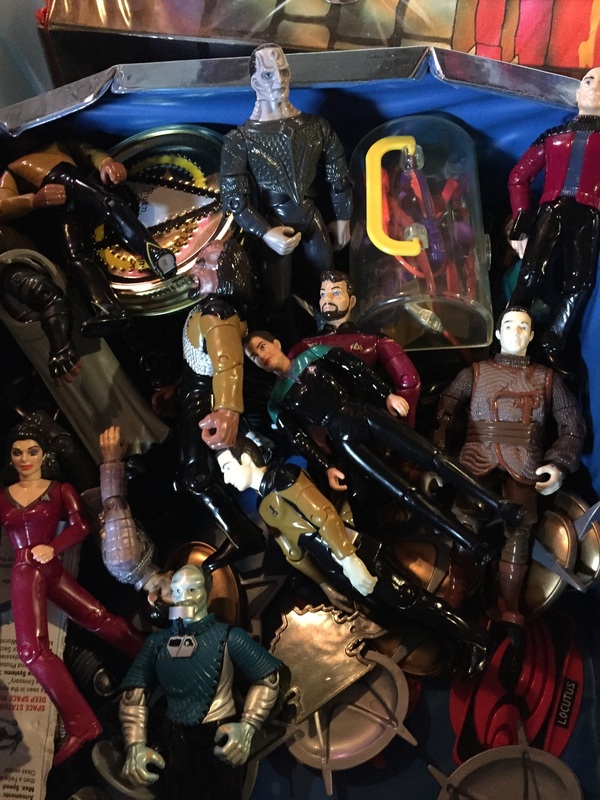 A case of Star Trek action figures. I was pretty cool. I did not predict a live-action Ninja Turtles movie in 2014. And of course Transformers, something else old that's new again. They also seem to have saved every school paper from third grade, and quite a few from other years all through high school. Here's a book we all got at our eight-grade graduation. One of my eighth-grade classmates correctly predicted what I'd be doing in 2007. And this should earn me major credibility from my Latin students. Again it goes without saying, I was pretty cool and popular. And not only did they save my letterman's jacket, but it still fits. I can finally prove to my students that I was a varsity athlete. I'm sitting here, wearing that coat and humming, "Glory Days." Just like the Force, when it comes to technology there is a dark side and a light. Interstellar is far from a perfect film, but it is a very good one, and I'm glad that it exists. What does it take for a high school student to go from straight A (and Type A), National Merit finalist, scholarship recipient to a Halo-playing, White Castle-eating slacker with a 2.8 GPA? I've been wondering this for the last, oh, twelve years or so. One year ago today, I tricked the woman of my dreams into marrying me. Still not sure how it happened. As I've told my students, I only had one pickup line: "Hi, I'm a Latin teacher." Fortunately for me, it worked exactly once. People say that no matter how prepared you think you are, "being married is competely different." I disagree, in a good way. I'd like to think that's because, to paraphrase one of my favorite movies, we chose wisely. Here's to another fifty years (according to the average lifespan of an American born in 1983). Also, she made me promise I wouldn't write anything about our anniversary. I'm bad at listening to directions. Good thing she's so forgiving.